With the development of poultry industry in nineteenth decade, this industry had to face many ups and down conditions. Day by day approximate 3-4 percent of its contribution on Gross Domestic Product (GDP). A large number of people were engaged in poultry sectors as a freedom business. This study was conducted to find out the present situation and future challenges of poultry industry. In this study, data were collected from 20 reputed poultry farms located in Rajshahi district, Bangladesh using a pretested interview questionnaire. The collected data was analyzed by using statistical package on social science. The results showed statistical table with explanation so that the reader could easily realize the outcome for the study. Some challenges such as lack of inclusive poultry policy principle, technical know-how, shortage of capital, maintenance of bio security, operation management, lack of trained manpower, lack of proper management information system, lack of adequate laboratory testing facility, improper handling of medicine and vaccine, disaster management, the dependence on the channel members, neighboring country threat, seasonal fluctuation, backdated marketing strategy etc. were found from this study. Based on findings, recommendations were made on some major issues like poultry guiding principle, technological efficiency, proper registration system, bio-security, management information system, laboratory testing facility, mechanical and managerial training, symbiotic and incorporated union, protection of consumer rights, financing for small farmers, professional distribution system etc. Rahman, S. M., Roy, B. K., Shahriar, S. I. M. & Nipa, F. Y. (2015). Poultry industry in Bangladesh: issues and challenges. International Journal of Business, Management and Social Research, 02(01), 71-79. Rahman, S. M., Roy, B. K., Shahriar, S. I. M. & Nipa, F. Y. 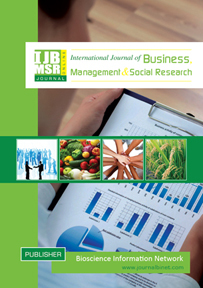 “Livelihood improvement of small farmers through family poultry in Bangladesh.” International Journal of Business, Management and Social Research, 01.02 (2015): 71-79. Rahman, S. M., Roy, B. K., Shahriar, S. I. M. & Nipa, F. Y. “Poultry industry in Bangladesh: issues and challenges.” International Journal of Business, Management and Social Research, 02, no. 01 (2015): 71-79. Authors: Saha, S. K., Ahmed, M. F., Roy, T. K. and Haldar, P. K.
The rich natural and cultural attractions are valuable ingredients for community based ecotourism development in Bangladesh. Every year, a large number of tourists visit in the Sundarbans, which has a significant contribution in the household income to the people who are mostly involved in this sector. The result of the empirical model of Durbin-Watson test revealed the model significant at 1% and 5% level. The income counted here is considered as dependent variable and the age, education, experience, number of tourist served; poor infrastructure; poor communication and transportation; poor knowledge about CBET; lack of government policy etc. as independent variable, the eco cottage quality, natural beauty and security are the dummy variable. The result shows that, the age, number of tourist served and absence of leadership and entrepreneurship ability are significant at 1% and 5% level; experience and the eco cottage quality also found significant for income. However, community based ecotourism industry in Bangladesh is facing many problems, such as lack of transportation and communication system, poor investment, political unrest situation of the country , lack of government policy, poor marketing policy to attract the tourists, poor knowledge about CBET, lack of well-planned accommodation, food, entertainment and other services to satisfy diverse categories of tourists. The issue of safety and security of the tourists of both domestic and foreign origins is also very important for the development of ecotourism in Sundarbans area. Though a policy has been adopted in the recent time for ensuring sustainable development of this sector, the strategies adopted under the policy are not yet being seriously taken up for implementation. Besides, the country requires a strong physical planning strategy to develop its urban and rural areas, and national transportation and communication system to establish connectivity to the tourism spots. There should be a strong marketing policy, business planning as well for the promotion of tourism in the country. Saha, S. K., Ahmed, M. F., Roy, T. K. & Haldar, P. K. (2015). Community based ecotourism in income generation: a study on the sundarbans adjacent area of Bangladesh. International Journal of Business, Management and Social Research, 02(01), 80-91. Saha, S. K., Ahmed, M. F., Roy, T. K. & Haldar, P. K. “Community based ecotourism in income generation: a study on the sundarbans adjacent area of Bangladesh.” International Journal of Business, Management and Social Research, 02.01 (2015): 80-91. Saha, S. K., Ahmed, M. F., Roy, T. K. & Haldar, P. K. “Community based ecotourism in income generation: a study on the sundarbans adjacent area of Bangladesh.” International Journal of Business, Management and Social Research, 02, no. 01 (2015): 80-91. Abstract: New product development (NPD) requires considering multiple criteria under a hierarchical structure. The evaluation process often involves uncertainty and fuzziness in both the relationships between criteria and the judgments of evaluators. Quality function deployment (QFD) aims to facilitate the NPD process from product conceptualization to production requirements. New Product Specification Forecast System (NPSFS) support product development and used from first matrix of QFD. A case study of a scale producer firm to select the Specification of new product based on data collected from designed questionnaires is given which includes identification & determination of customers’ needs, while looking for technical and engineering characteristics related to their needs. The results are then used to construct houses of quality for QFD, which is incorporated by fuzzy AHP. It is concluded that the proposed decision support system by fuzzy QFD can be used as a powerful tool to select the most suitable specification for new products to satisfy customer's needs. Jeddi, K. Y. (2016). A fuzzy decision system for new product specification forecast. International Journal of Business, Management and Social Research, 02(02), 105-113. Jeddi, K. Y. “A fuzzy decision system for new product specification forecast.” International Journal of Business, Management and Social Research, 02.02 (2016): 105-113. Jeddi, K. Y. A fuzzy decision system for new product specification forecast. International Journal of Business, Management and Social Research, 02, no. 02 (2016): 105-113. Abstract: In recent years, the interest of researchers towards the problems of modern poetry has steadily increased. Poetic language became a research object of many scientists of the national and the foreign linguistics. The majority of the linguists who study a poetic language believe that the linguistic analysis of the poetic text can be carried out in accordance with different principles. However, the specific nature of the poetic language should be always taken into consideration. Ilhombaevna, T. I. (2016). The role of speech expressive means in Spanish poetics. International Journal of Business, Management and Social Research, 02(02), 114-117. Ilhombaevna, T. I. “The role of speech expressive means in Spanish poetics.” International Journal of Business, Management and Social Research, 02.02 (2016): 114-117. Ilhombaevna, T. I. The role of speech expressive means in Spanish poetics. International Journal of Business, Management and Social Research, 02, no. 02 (2016): 114-117. Abstract: The study was conducted in three districts namely Narshingdi, Jessore and Bogra to assess the postharvest losses of brinjal. Multistage sampling technique has been used for selection of 90 brinjal growers and intermediaries, out of which 15 farmers and 15 intermediaries from each district selected randomly. Both descriptive and inferential statistics were used to calculate the postharvest losses of brinjal at different stages and determine the factors responsible of postharvest losses of brinjal at farmer level; a multiple linear regression model was carried. Total postharvest losses of brinjal were estimated by taking total losses at farmer, Aratdar, Bepari and retail level. A total postharvest loss of brinjal was 23.38%. Highest loss was estimated that 12.51% at the grower level. Among different intermediaries post harvest loss of brinjal was highest at retail level (5.96%) than Aratdar level losses (2.35%) and Bepari level losses (2.65%). Farming experience, sale price, transportation had negative and total production and weather had positive and significant relationship with the total postharvest loss of vegetable. Absence of postharvest treatments, low market price, lack of available storage facilities, and poor and costly transportation were the major problems at farm and intermediaries level. Proper storage facilities, easy transportation, applied scientific method of harvesting and fair price policy suggested by the study to minimize the postharvest loss. Abstract: The aim of the study was to determine the role of opinion leadership in diffusion of agricultural innovation. The study was performed in the Alamdanga Upazila under Chuadanga district. Among the unions of Alamdanga Upazila Kalidaspur union has been selected as the study area. Fifty five farmers were randomly selected to explore the opinion leader. Thus 165 names of opinion leaders were found. After cross checking and deducted the duplicate name a list was prepared with 138 local leaders and communicate with them for interviewing and bring into being available 115. Among the respondents, the highest 54.80 percent respondent opinion leaders belongs to the group of lowest role in diffusion of agricultural innovation followed by 34.80 percent in moderate role group and the lowest percentage 10.40 percent n highest group in diffusion of agricultural innovation. Education level, extent of advice on adoption of agricultural innovation, innovativeness, organization participation, agricultural knowledge, motivational activities and diffusion network had significantly positive relationships with role of opinion leadership in diffusion of agricultural innovation. Annual income had no significant positive relationships with role of opinion leadership in diffusion of agricultural innovation. Besides, age and family size of the respondents had no significant negative relationship with role of opinion leadership in diffusion of agricultural 1st and serve as center of inter personal communication network in positioned 10th as per in case of role of opinion leadership in diffusion of agricultural innovation. Abstract: The study was undertaken to examine the profitability of sugarcane cultivation in char areas of Gaibandha and Kurigram districts of Bangladesh. Main objectives of the study were to explore socio-economic condition, profitability of sugarcane cultivation in char lands, factors affecting sugarcane cultivation and constraints of sugarcane cultivation in char areas. Data were randomly collected from 60 farmers taking 30 farmers from each district. A pre-tested interview schedule was used for collect data. Both descriptive and functional analyses were used in this study. Per hectare cost of sugarcane cultivation in char areas were Tk. 113976.5 which was higher in Gaibandha districts (Tk.121113) followed by Kurigram district (Tk.106840). Average yield of sugarcane in two districts were 62.04 t ha-1. Per hectare net return was Tk. 62252 in the study area. Average BCR over variable cost of two districts was 1.81 which was higher in Gaibandha district 2.06 followed by Kurigram district 1.53. Human labor, Urea, TSP and irrigation were positively significant but organic fertilizer was negatively significant in the study areas. Irrigation problem, lack of clean seed, lack of adequate crusher machine, infestation of disease and pests, low price of sugarcane, lack of transportation facility and lack of money are the major constraints of char sugarcane farmers. Islam, M. S., Khatun, S., Kamruzzaman, M., Kaysar, M. I. & Islam, S. (2016). Economics of sugarcane cultivation in some selected char lands of Bangladesh. International Journal of Business, Management and Social Research, 02(02), 132-139. Islam, M. S., Khatun, S., Kamruzzaman, M., Kaysar, M. I. & Islam, S. “Economics of sugarcane cultivation in some selected char lands of Bangladesh’’. International Journal of Business, Management and Social Research, 02(02) (2016): 132-139. Islam, M. S., Khatun, S., Kamruzzaman, M., Kaysar, M. I. & Islam, S. Economics of sugarcane cultivation in some selected char lands of Bangladesh. International Journal of Business, Management and Social Research, 02, no. (02) (2016): 132-139.